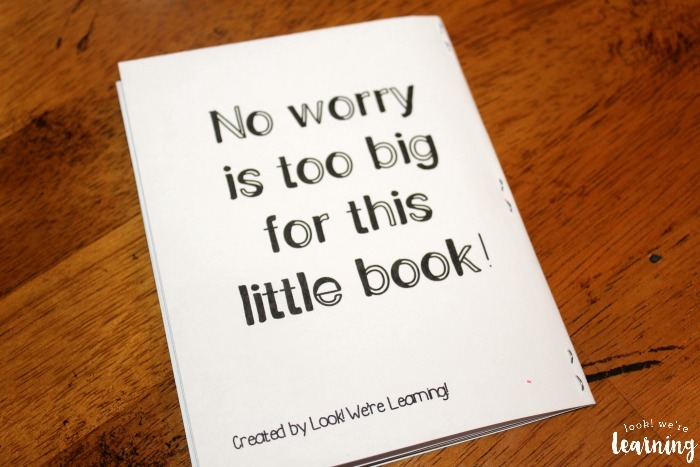 When Your ADHD Child Worries - Look! We're Learning! Until I was an adult, I had no idea what the symptoms of ADHD were, much less that I was living with it myself. But as I began exploring the symptoms, I found out that excessive worrying is one of the hallmark symptoms of this disorder. As our children grow, we’ve noticed that some of them are what I would call “physically anxious”. For example, our hyper child actually becomes irritated when he has to sit down for long periods of time. But others are “emotionally anxious”. One of our boys has low energy and can be sluggish, but inside he’s a boiling kettle of emotions, including lots and lots of worries. 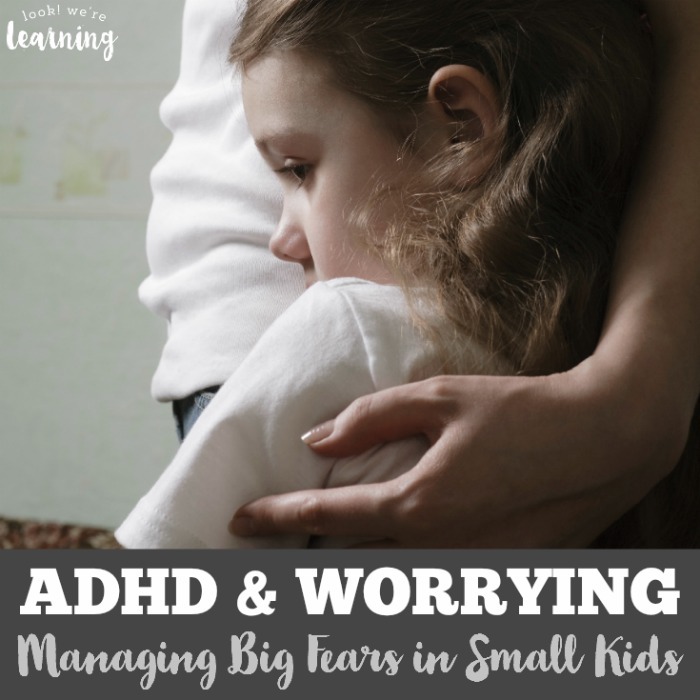 What can you do when your ADHD child worries? How can you help them manage these big emotions while they’re still small? 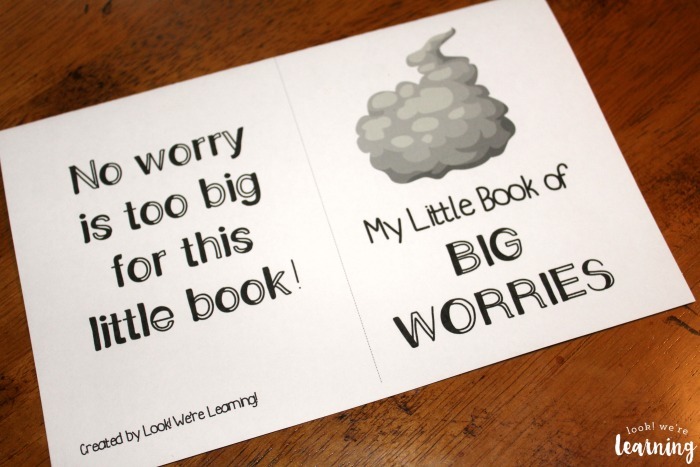 Read on to find some tips that are working for us and to pick up a free resource your kids can use to process emotions themselves! 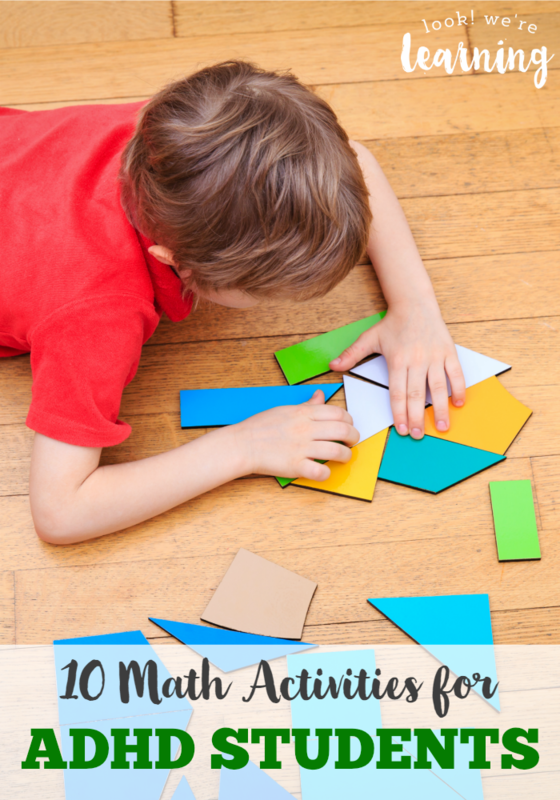 If you enjoy this post, don’t miss these pointers for how to show love to a defiant child too! First, try to comfort your child. No one can think clearly when they’re upset, especially not a child. Let him or her know that you are there and ready to help. But make sure that the way you comfort them is geared toward that specific child. One thing that works with my hyper child is physical touch. If I hug him or bring him close, he calms down quite a bit. For my emotionally anxious child, holding his hand seems to work better. He doesn’t respond as well to hugging. If your child doesn’t respond to physical touch at all, just sit nearby and say “I’m here to help” or something similar. It’s important that we make sure our children feel that we value their emotions. If we just hug them or hold their hands and “pooh-pooh” their feelings, we’ll seem patronizing. But when we respect our children’s emotions, we model that behavior for them. They will learn to stop and give their feelings attention, rather than ignoring them or pretending they don’t exist. Follow up physical touch or verbal reassurance with active listening. Sit down near your child, give him or her direct eye contact, and then listen to their feelings. Be sure to offer feedback that shows you are taking an interest in their expressions. 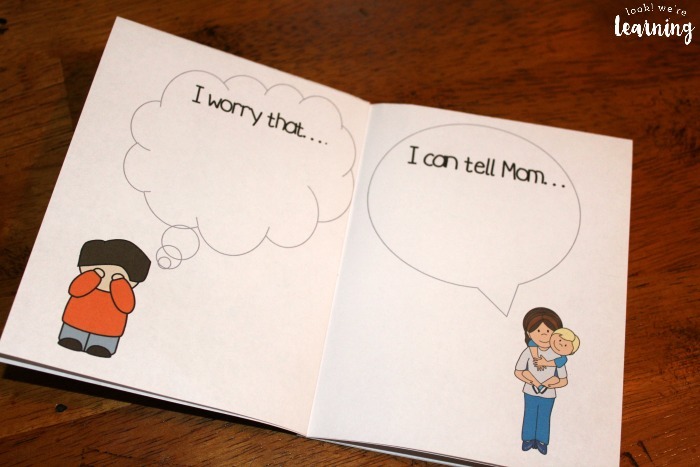 Once your child expresses his or her worries, show them how to process them and go forward. 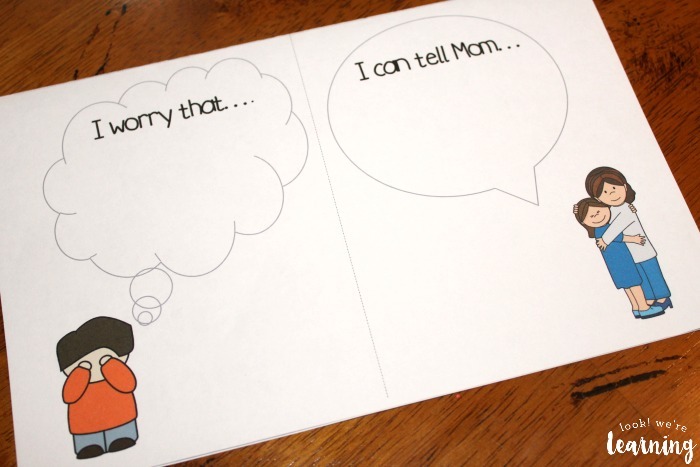 For example, one of my children worries constantly about how he is viewed by others. He has actually let that fear stop him from speaking up about something he didn’t want to do, which shows that he’s especially susceptible to peer pressure. To help, we talk with him about his feelings privately – away from his siblings. We’ve also found that helping him brainstorm how to talk about his fears has given him a lot more freedom to express himself to us. We also work with him to explore his likes and dislikes, so that he can become more vocal about expressing his interests without fear of rejection. It’s helped him to stabilize his emotions quite a bit. 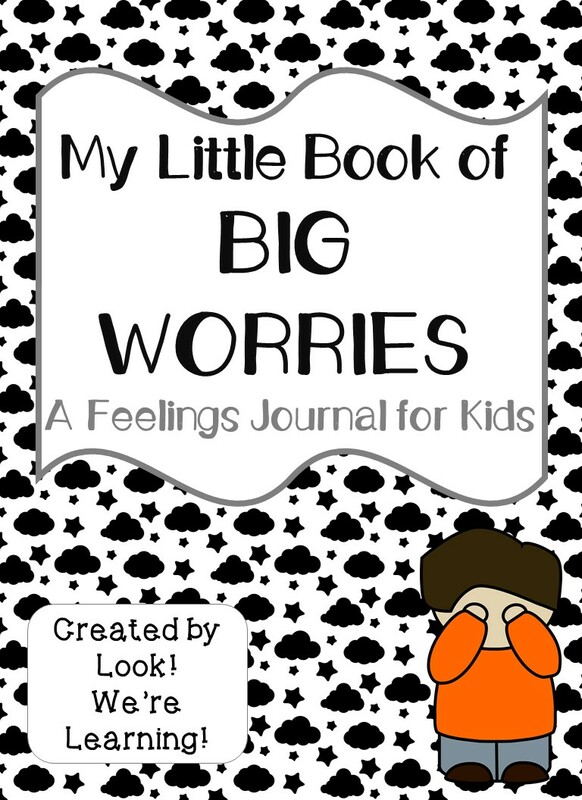 Since helping our kids to express their worries has helped us, I thought you’d like to try this free worry journal with your kids! 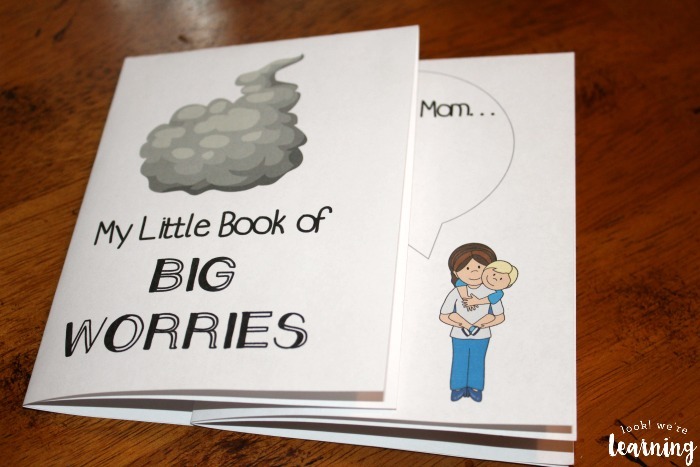 It’s called “My Little Book of Big Worries” and it’s for helping anxious kids to process their feelings and how they can talk about them. 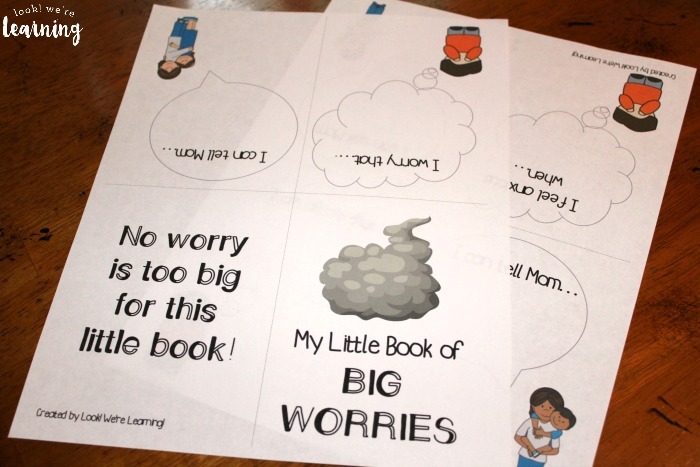 Use this printable feelings journal for kids to help your children write down their big worries in a pocket-sized printable book! 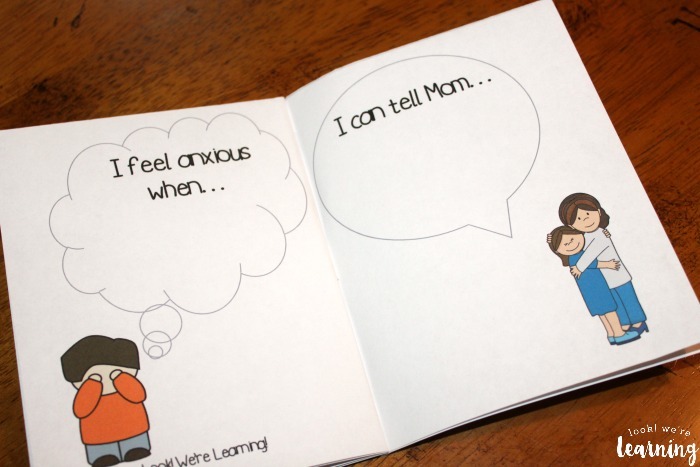 Children can use this journal to write down what makes them feel sad, anxious, or worried and brainstorm how to express these feelings to their moms. Take the first page (which contains the front and back covers) and fold it in half horizontally. This is the front and back cover half. This is the inside page half. Fold the first page in half horizontally again to form a small book. Then fold the second page in half horizontally also and then place it inside the first “book”. You should end up with an eight-page book. Add a few staples along the front edge to secure it. 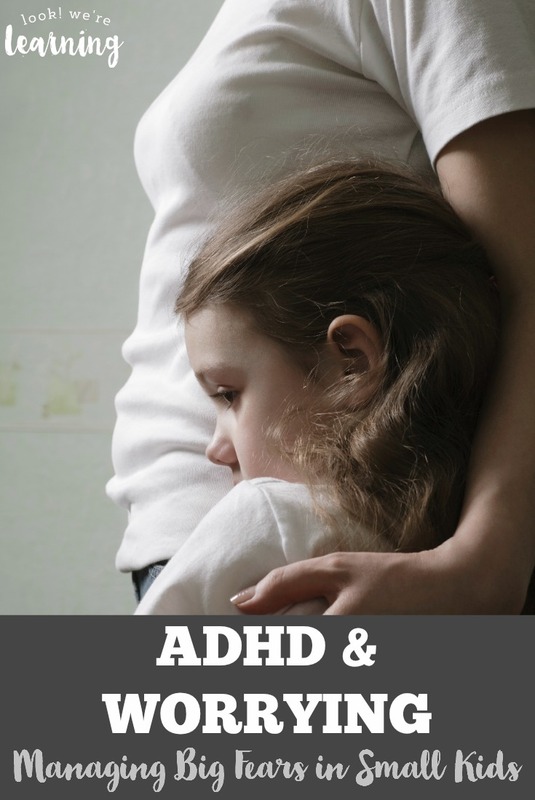 What do you do when your ADHD child worries? 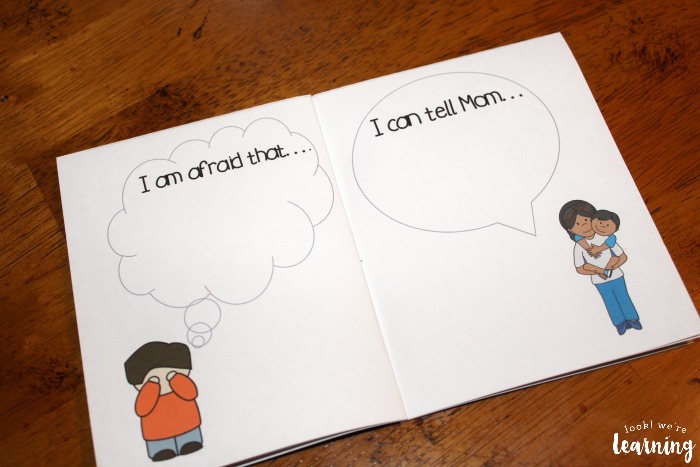 How do you help them manage their big fears? Share your tips and suggestions in the comments! 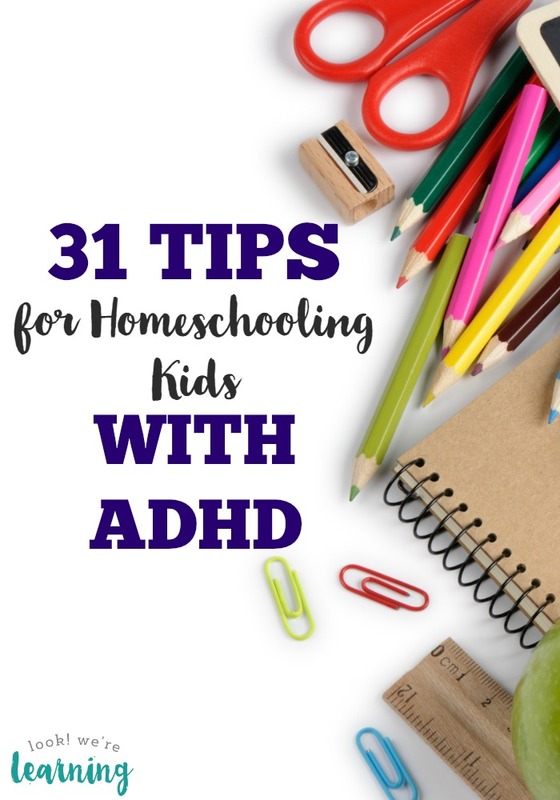 Need more help to parent your child with ADHD? Don’t miss these posts! 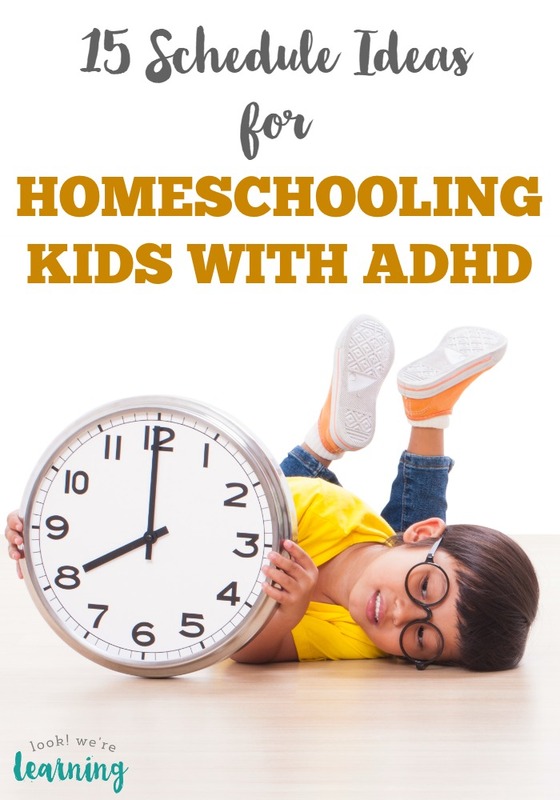 See more parenting help for kids with ADHD on my ADHD Tips Pinterest board!